iPhone 7 and iPhone 7 Plus fuse data, processors, even lenses, to bring us the best performance, battery life, and cameras ever — minus one headphone jack. We live in the age of iPhones. Apple has sold over a billion of them now, and they're used every day by our families, our friends, our colleagues, our classmates. Not too long ago, the idea of so many of us having incredibly accessible, always connected, supercomputers in our pockets would be the stuff of science fiction. Now, it's so commonplace we take it for granted. Blame it on the steady pace of iteration. The technology is so mature now that sometimes we don't even notice the year-over-year improvements. It's only when we look back over a few years that we realize how much has really changed. Typically for the better, but not always. Enter iPhone 7 and iPhone 7 Plus. Apple calls them the best and most advanced iPhones ever. In many ways, they're exactly that. They've got significantly improved cameras, including a new fusion camera on iPhone 7 Plus. They've got better cellular radios, and processors, including a new A10 Fusion. Also, for the first time, they're officially water resistant. But Apple has also deleted the 3.5mm headphone jack and virtualized the home button. And some would argue one or both of those things makes iPhone 7 just as significantly worse. That's what's so interesting this year. Apple has taken one of the most successful and profitable products in the history of products, and gambled its present for what they strongly believe is a brighter future. Done right, and it propels technology forward, kicking and screaming though it might be. Done wrong, and it risks alienating the very customers that made the product so successful and profitable. At the time of this writing my colleague, Serenity Caldwell, and I have each had an iPhone 7 and iPhone 7 Plus review unit for four days total, two of which we spent testing them out on the streets of New York. We crossed the Brooklyn Bridge at midnight. We went to Apple World Trade Center. We caught Pokémon at Battery Park at sunset. And we got to see the iPhone 7 and Apple Watch 2 launch at Apple 5th Avenue. In other words, we used iPhone 7 and iPhone 7 Plus in the real world like real people, sometimes on Verizon, sometimes roaming on AT&T or T-Mobile. This preliminary review is based on those experiences. Like all of our reviews going forward, though, we're going to be updating and expanding it over time, as we link to and add camera tests, long-term battery life tests, and more. In other words, it's going be a living review — so check back often. Also, unless noted otherwise, all videos and photos used in this review were shot with iPhone 7 or iPhone 7 Plus. iPhone 7 and iPhone 7 Plus take away the 3.5mm headphone jack and physical home button, which some will find inconvenient if not infuriating. What they add, though, are better cameras front to back, with significantly improved low-light performance, and a new 2x optical zoom on the Plus model, with simulated bokeh to come. There's also water resistance, designed to save your iPhone if it accidentally gets flooded or dunked, and a much more powerful processor that's also efficient enough that, when combined with a slightly larger battery, can provide for an hour or two of extra battery life a day. The speakers are also louder now, top and bottom, and stereo, and the phones can capture and display P3 wide gamut color. If you have an iPhones 6s, you'll need to really want the new cameras or water resistance in order to upgrade. If you have an older iPhone, or are looking to switch to iPhone, then iPhone 7 is a significant upgrade and well worth considering. If you'd like to watch this review rather than read it, we've got you covered. Here's the video version of my colleague, Serenity Caldwell and I, taking our iPhones out to take Manhattan! Included in the iPhone 7 box are the phone itself, information pamphlets and Apple stickers, Lightning EarPods, 3.5mm to Lightning adapter, a Lightning to USB cable, and an AC adapter. iPhone 7 looks a lot like the last couple of iPhones. I get it. As observations go, it's far from insightful, but I get it. Here's the thing: iPhone is iconic. It's an object Apple's industrial design team has been working endlessly to refine since before the original shipped. At the risk of being just as trite, it's their Porsche 911 or Rolex Submariner. Just like human hands have evolved into a uniformly useful shape, so, too, have phones designed to fit into those hands. If triangular- or donut-shaped phones had been better, they'd have won. But they didn't. That's why pretty much every phone from pretty much every manufacturer are similarly rounded rectangles, year after year. Both slipped easily in and out of my non-hipster jean pockets, front and back, and let me easily reach coffee shop — and even hotel vending machine (!) — Apple Pay terminals with ease. In other words, the shape is fine. Don't stress about it. Worthier of critique is the screen resolution. For the third year in a row, Apple has also retained the 1334 x 750 display for iPhone 7 and 1920 x 1080 for iPhone 7 Plus, while other vendors have pushed to 1440 x 2560. 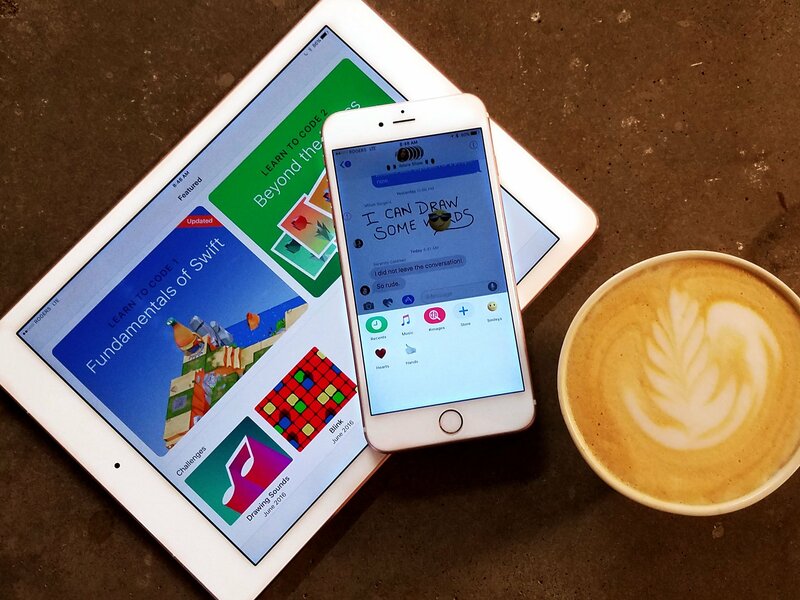 Apple's choice saves on battery life — fewer pixels means less to power. That's especially true given iPhone still uses LCD panels and not more energy efficient OLED. 326 pixels per inch (ppi) and 401 ppi are plenty dense for the naked eye, but only at a normal viewing distance. For applications like VR headsets, they're no longer good enough. Apple uses OLED in the Watch, but hasn't shown much public interest in VR. As currently implemented, Apple's pressure-sensitive technology for iPhone, 3D Touch, also requires the LED backlight of the LCD panel to measure pressure. Apple is also maintaining one of the higher bezel-to-screen ratios in the industry. In other words, competing phones with big screens manage to get by with smaller cases. That makes them easier to hold and to carry. I'd love to see Apple go in that direction as well. I think it would make the 4.7-inch iPhone even more attractive, including to people who chose to go with the 4-inch iPhone SE instead. The iPhone 7 design has evolved in a few ways, though. The camera housing for both the single iPhone 7 lens and dual iPhone 7 Plus lenses is no longer a separate piece but milled now into the aluminum casing. I like the look, and unless there's some magical breakthrough in physics, the camera hump won't be going anywhere for a long, long time. So, like with the Smart Battery Case, iPhone 7 is owning it. There are also two new finishes. The first is a glossy Jet black, reminiscent of the iPhone 3G or iPhone 3GS but still anodized aluminum, not plastic. Apple impregnates the metal with dye and then polishes it for hours on end to get the shine, which also makes it the least slippery iPhone I've held since that same iPhone 3G/iPhone 3Gs casing. And just like iPhone 3G/iPhone 3GS, it shows smudges, fingerprints, scuffs, and scratches far more prominently than any of the other finishes. It's great if, like me, you can live with the "worn objects" look, like the Millennium Falcon. If not, there's also a matte black option. It's much darker than the old slate and space grays. It's also still anodized aluminum, which is really hard to get this dark without getting gloppy, so kudos to Apple's materials team. If you want to keep your iPhone 7 looking blacker longer, go for matte, or for the silver, gold, or rose gold finishes Apple has carried over from last year. If you consider the antenna lines less racing stripes and more distractions, the blacks, and to some extent the silver, conceal them much, much better. If bling is your thing, though, the metallics still look great. Update: On March 21, 2017, Apple introduced a new color option for iPhone 7: (Product) Red. It has a deep red anodized aluminum back with color-matched antenna lines, and a white front. Like the jet black model, it's only available in 128 GB and 256 GB configurations. Otherwise, the design and features are identical to the previous finishes. With iPhone 7, Apple has deleted the 3.5mm headphone jack. It's gone, gone. For anyone and everyone used to using 3.5mm headphones with their iPhone, that'll be inconvenient at best, and a show-stopper at worst. Or at least it'll seem that way. My guess is Apple's been wanting to delete the headphone jack for years. It takes up precious space inside an iPhone while offering functionality that's easily duplicated by the other, smarter port on the bottom: Lightning. Removing it now, according to Apple, gave them the space to add optical image stabilization to the iPhone 7 camera, a second lens to the iPhone 7 Plus, a better fit and position for the new Taptic Engine, and an increase in size of the battery. Every new feature Apple wanted to ship was made easier to ship by removing one, relatively old, extremely limited, relatively redundant port. I'm OK with the decision for a couple of reasons: First, even though I just bought a new pair of wired B&O headphones, which I adore, I also picked up a new pair of Bose wireless headphones that are so good, and so convenient, I've been using them instead of the B&O. As much as it surprises me to say it, Bluetooth really is coming of age, and once you cut the cord, it's hard to go back. Second, Apple is including both a pair of Lightning EarPods and a 3.5mm to Lightning adapter in the box. Apple failed to include an adapter back during the 30-pin Dock connector to Lightning transition in 2012, and didn't have any in stock at retail either. It was inexcusable. But it also seems to have been enlightening. This year, in addition to the adapters in the box, there's stock available at retail — and at only $10 a pop. There are some reports of controls freezing after five minutes with the adapter. We're in the process of testing that out and will update with our findings. Some people will barely notice the transition. They'll simply pull out the default EarPods and start grooving like they always do. For others, the adapter will ease the pain of transition, especially if it can be put on and left on. Otherwise, if you swap your headset between devices regularly, it'll hurt for a while. The new Apple wireless AirPods (see below) are fantastic, and really do point to the future of — don't make me write hearables! — wireless wearables. But they're too expensive to bundle in. USB-C, even though Apple had a lot to do with spearheading its development and uses it on the Mac, is bulkier and not as flexible as Lightning. The 3.5mm headphone port was used by more than just headphones, though. Everything from credit card swipers to pH meters used the 3.5mm port to connect to iPhone and iPad without having to go through Apple's Made For iPhone/iPad (MFi) program. It's always possible Apple will open up Lightning or make the Made For iPhone/iPad (MFi) program more accessible to everyone from indie designers to kids in school, but they likely don't have to bother. Wireless is already a standard, thanks to Bluetooth, and manufacturers may decide swapping one tether for another isn't the forward-thinking solution. That's why removing the headphone jack feels like yet another case of forced evolution. Though it's already been repeated ad nauseum Infinitum, Apple deleted the floppy drive, deleted FireWire, deleted the 30-pin Dock, deleted the optical drive, and has all but deleted the ethernet port. In many of the latter cases, wireless was one of, if not the major replacement — so it seems with the headset jack. My guess is, in a couple of years, we'll think about the headphone jack about as much as we do those other technologies — seldom, if at all. If you don't want to use Lightning headphones or the 3.5mm to Lightning adapter, there's another option: Bluetooth. iPhone 7 supports Bluetooth 4.2 Low Energy. That makes it easy to pair with accessories, stay connected without expending a lot of power, and then quickly burst or stream data when you need to, including audio. As an added benefit when you're spending a lot of time moving around, there's no cord to pull on the headphones, which means less tension and less chance they'll come out of, or off of, your ears. Apple, though, wants to make it even better — with their new W1 wireless chip. W1 lives in the headphones and, when combined with iOS 10, makes Bluetooth pairing even easier and more energy efficient. Back to W1: Three new Beats-branded headphones will support it, as will the Apple-branded AirPods. They're not shipping until later this fall, so I won't review them now. But I have been trying out a pre-production set for the last four days and they've been tremendous. Snap open the case and they pair automagically. Put one in your ear and the music switches from your iPhone to the AirPod. Put in the other and it goes stereo. Take one out again and it pauses. Tap twice to answer the phone or invoke Siri. There are beam forming mics, so you can talk normally and the AirPods just pick it up. It's like Star Trek, and it's exactly the kind of delight you want and expect from Apple. Better iPhone speakers have been on my wish-list for years. For a company whose modern fortunes were founded on music, the state of iPhone speakers to date has been depressing. No longer. Now they're loud, clear — and stereo! Instead of putting two speakers on the bottom, though, Apple has amped up the existing speaker on the bottom, but also turned the earpiece on the top into a full-on companion. That provides for far greater separation, and hence the potential for real stereo sound. Like iPad Pro, they also switch channels as your rotate your device. That way left is always on the left, regardless of which side the home button is on. What fascinates me most, though, is that Apple managed to get impressively deep, rich sound from such tiny speakers, and that even though one is pointing down and the other out, both sound indistinguishable in use. My guess is Apple solved the problem by throwing money at the components and engineers in the mix, which works fine for me. We shared videos during our trip through New York, both ones we shot and ones we were sent or stumbled across on YouTube, and most of the time they were loud enough to hear, even on the streets. Since then I've also used them to make calls and to listen to podcasts — yes, on the speaker, like an animal — and I couldn't be happier with the improvement. There's been some weird commentary surrounding iPhone 7 having a "fake" speaker grill on one side. Here's the deal: They aren't "speaker grills" on iPhone, just grills. 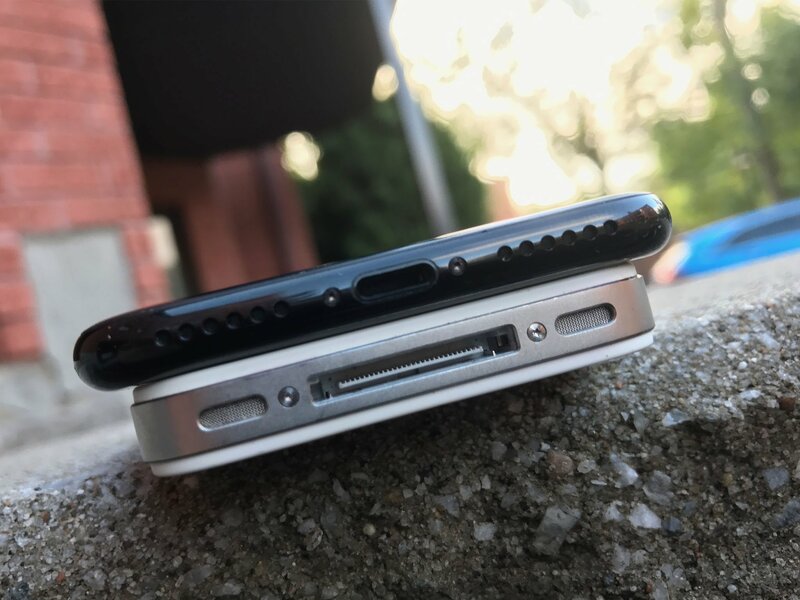 Apple has done this frequently over the years, including on every iPhone from the original to the 4s (which all had the headphone jack on the top). One grill covers the speaker, the other covers mics, enables the barometer to function, or does whatever else Apple needs it to do on opposite side. It's an example of painting the back side of the fence. The iPhone 7 camera system is beyond impressive. I expected it to be better than iPhone 6s, but I didn't expect it to be so significantly better, especially in low light. At the risk of being overly dramatic, I remember the feeling I had the first time I shot with a fast 50 at 2 a.m. outside Moscone West and got images brighter than my eyes could see. iPhone 7 obviously isn't equivalent to a DSLR and big, expensive lenses, but when I took it for a walk at 2 a.m. across the Brooklyn Bridge, or shot the sunset at Battery Park, and saw what I was getting just by pointing, tapping, and shooting off a phone, the feeling was the same. Both iPhones 7, including the smaller 4.7-inch model, now include optical image stabilization (OIS) for the rear-mounted 12 megapixel, f/1.8 wide angle lens, and 4K video camera. That means the shutters can stay open longer in low light and produce better, brighter photos and videos — sometimes where older or other cameras would have produced nothing at all. It's great for when you're in a dimly lit room or out at night. To prevent any aberration that might occur from the increased aperture, Apple's added a 6th, curved element to the lens package. That way it isn't just the center of the image that looks great, but the whole image. And, again, it makes for photos and video that are ridiculously good. So good, it's hard to believe they came from phones. Both also have a new 7 megapixel, 1080p front-facing camera. It's f/2.2, but it uses technologies like deep trench isolation to ensure colors are as clean as possible. And that's great, since selfies, like iPhones, are mainstream now, and it's about time Apple started paying as much attention to the front optics as they have been the back. 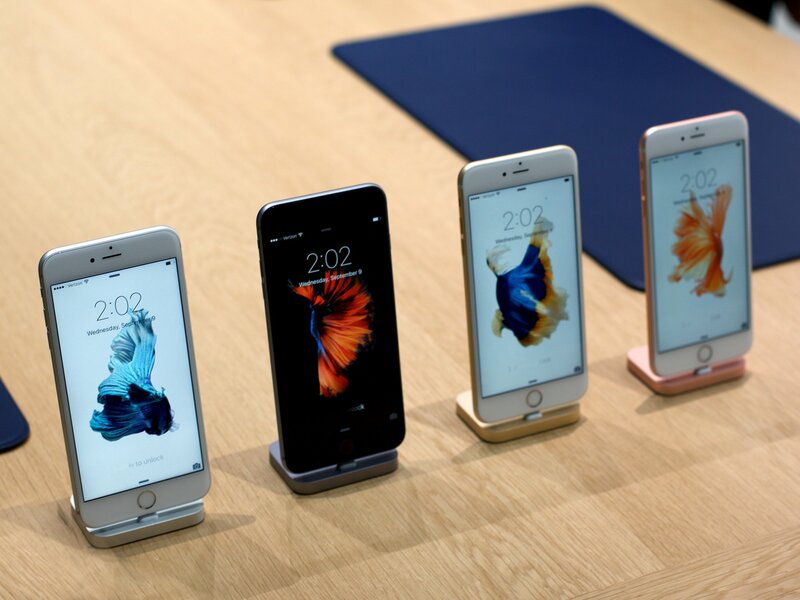 The bigger iPhone isn't giving up its optical edge just yet, though. Instead, it's doubling down: iPhone 7 Plus now has a dual camera system. Next to the effectively 28mm wide angle lens is a new, effectively 56mm telephoto lens. It's also 12 megapixels, but f/2.8 and, sadly, there was no room left inside for Apple to jam in a second stabilization system. That means it's not as useful in low-light situations, but that's not how Apple's positioning it anyway. Instead of just dropping two lenses on you and leaving you to figure it out, Apple's fusing them together into a single camera system. The implementation details are abstracted away, and all you need to do is point, maybe tap, and shoot. Under normal circumstances, the camera will pull data from both lenses and use it to make the best hybrid photo it can. That involves billions of calculations on the image signal processor (ISP) behind the scenes, but again nothing the user needs to worry about. You see something you want to shoot, you pull your iPhone out and shoot it, and the camera system does everything it can to give you a great photo in as wide a range of circumstances as it can. Then there's the new zoom. Hit the 2x button on the view finder and, under normal or better lighting conditions, the camera will switch to the telephoto and give you really good quality optical zoom. Thanks to a new, really clever, one-thumb optimized interface, you can also quickly swipe to up to 10x digital zoom as well. Up to 5x looks surprisingly good. 10x looks like you'd expect maximum digital zoom to look. Because it's effectively 56mm, the telephoto captures less of the frame, but also preserves a far more natural perspective. I've been leaving it in 2x and using it like I would a not-so-fast 50mm, and I've enjoyed it immensely. It lets me keep some distance but at the same time frame more closely than I could with any previous iPhone camera. It came in handy when shooting from a distance at World Trace Center. If you want full, manual control, App Store apps can access each camera separately, and even pull RAW data straight from the sensors and save it in Adobe's DNG (Digital Negative) format. Coming later this year, there'll also be a portrait mode. With it, the camera will use both lenses to create a depth map. Then, it'll apply a blur effect, and give you a simulated version of that great looking "bokeh" shallow depth of field you see on fancy cameras with fast lenses. Those types of ongoing updates, including security updates, provided for free to every customer, in every region, on every carrier all at the same time, is an important part of iPhone's value. Just like getting the latest version of iOS on the latest phone, and ongoing day-and-date updates for years to come. Conversely, though, it's a shame Portrait Mode is only coming in a future update. It leaves the two-lens system feeling like a work in progress — like it was meant to be much more ambitious and powerful than what Apple managed to ship at launch. Far beyond optical zoom and faux-keh, the potential is enormous. Apple just has to realize it. When Apple showed off the iPhone 7 Plus, one of the big features they demonstrated was Portrait Mode. It used the two cameras to capture a both the subject and depth information about the scene, build a multi-layer depth map, then use a custom disk blur to simulate a depth-of-field, or bokeh, effect around the subject. In beta for over a month following the launch of iPhone 7 Plus, it shipped to the public with iOS 10.1. I've been using it since the beta, and I'm really pleased with it. Though it's designed for portraits, as the names implies, and uses face detection as part of the process, the real world range is much wider. It works great on pets, of course — my colleague, Serenity Caldwell, has dubbed it Pet-rait Mode — but also for nature photography, still life, product shots, food picks, and more. The only place where it has real trouble is highly reflective surfaces, which makes taking pictures of bottles, glasses, and — haha! — iPhone 7 in Jet Black difficult, since it'll mistake the reflections for areas that need blurring. Apple has also made a lot of really smart choices with the software. For example, because Portrait Mode needs a lot of light to properly engage the f/2.8 telephoto lens, lower light portraits will be noisy. Instead of just leaving them noisy, Apple tweaked the software to make that noise reminiscent of old-style film grain. The result is something almost better felt than seen. There's an emotional content to the Portrait Mode photographs that I've not experience on camera phones before. The Camera app interface is great as well. Since getting a Portrait Mode shot requires specific distance and lighting, the app coaches you through the process. It'll tell you to get closer or further away, and when you need more light. When you take the picture, you also get both the regular and the Portrait Mode version, just like you do with HDR, so you can pick the one your prefer. The Portrait Mode version is labeled "Depth Effect", though, which is an odd choice given Apple specifically called the feature "Portrait Mode". The latter is a better, more mainstream friendly choice, but I'd like to see it reflected in the photo labeling as well for consistency's sake. Even though it's not what Portrait Mode was optimized for, I also like the product shots enough that I haven't shot with my Canon 5D Mark II since getting iOS 10.1. I do have to be more careful about light and angles, but I can now shoot anywhere, at any time, without lugging a DSLR with me. And for people, pets, pictures of iPhones and coffee, and everything else, that's exactly what I wanted from Portrait Mode. About the only thing I'd love to see improved is the ability to use it in lower light one day. There's one other trick up iPhone 7's camera sleeve: It can capture images in a wider color gamut than typical cameras. Specifically, in Digital Cinema Initiative P3 (DCI-P3), which Apple calls Display P3. It's the color gamut used by digital movie projectors in the U.S., and wider than the typical sRGB space used by most phone, tablet, and computer displays. It means, with iPhone 7, you get deeper, richer, brighter, and more beautiful reds, magentas, and oranges — far closer to what the human eye can actually see. What's more, iPhone 7's Retina HD screen can also display P3 as well, just like the 2015 Retina 5K iMac and the 9.7-inch iPad Pro. It's also significantly brighter than the iPhone 6s display, and slightly easier to use outdoors in direct sunlight. Sadly, there's no True Tone like on the 9.7-inch iPad Pro. That's Apple's color temperature color matching technology. It prevents the baby Pro's screen from looking too cold and blue or warm and yellow, and instead keeps it a soothing, papery white. Apple may not have been able to fit the extra ambient light sensors needed to drive True Tone into the already highly space-constrained iPhone casing, but I'd love to see it one day. Everywhere. The results are eye-popping when you see it on screen. Those reds, magentas, and oranges really pop, almost like a layer of haze has been wiped away. I showed the photos we'd been shooting to many of the people we met during our trip, and they were likewise blown away. Once you see P3, all other displays look drab and dull. I had a chance to visit Dolby last June and see their high-dynamic range (HDR) theaters. Side by side, deep color at 1080p was more impressive than standard color at 4K. HDR television sets at 4K are unbelievable and, though expensive, have been making their way onto the market for a couple of years now. It'll take some time, but deep color ubiquity seems to finally be on the horizon, and I couldn't be happier. Apple has been taking the lead in mobile silicon for a while now. They were the first to go 64-bit, and since they have no cross-platform baggage to support, don't deploy third party chips in addition to their own, and don't have to care about profit and loss at the chipset level, they can build exactly what they need each and every year, and just keep on racing ahead. This year, though, the A10 is doing something new — fusion. Apple has pushed their high-performance dual cores so far, so fast, they've risked creating a gap at the low end. Instead of leaving it that way, though, they've taken the opportunity to slide in a couple of high-efficiency cores as well. That totals four cores: two big.LITTLE-style cores. But the system only ever sees one set at a time. That's because Apple's custom controller works invisibly, behind the scenes, to assign the right set to the right job. Combined with a hex-core graphics processor, it once again allows Apple to leap ahead in terms of power, but also in terms of power savings. On the power side, Apple's got the lead in "multi-core" performance, even though it's using only two cores at any one time, and other processors can have considerably more. That's where Apple's lead in "single core" is valuable to see, almost doubling that of competing processors. Astonishingly, A10 even trounces the current MacBook Air, and is comparable to the 2013 MacBook Pro., both of which run Intel 64-bit core duo processors. And it fits in the pocket of your skinny jeans. On the efficiency side, add in slightly bigger batteries, and iPhone 7 effectively gets an average of two extra hours of power a day, and iPhone 7 Plus, one extra hour. That's important because as much as the early days of iPhone were about battery life while checking email and surfing the web, now it's about battery life while using Facebook, Snapchat, or Pokémon Go — with screen on, data transferring, and GPS tracking all at once. It's brutal, so any improvement is significant. An extra hour or two, tremendous. M10, the new motion sensor fusion hub on iPhone 7, is integrated same as last year, and provides the same functionality: It lets the A10 sleep while it keeps track of acceleration, gyroscope, altitude, and all the other positional metrics. For LTE, iPhone 7 supports an additional band this year, as well as 3x carrier aggregation for speeds up to 450 Mbps. You'll never get that, though, unless everyone else is on vacation and you're sitting alone on the tower. Apple has also switched to Intel for some of the modems this year. That means not all iPhones 7 support CDMA — Verizon and Sprint's legacy, industry-restraining, technology. It saves on the exorbitant CDMA licensing feeds the rest of the world has been forcibly eating for years, and doesn't affect most of that world at all. If you're on or think you might eventually switch to Verizon or Sprint in the U.S., though, you'll want to make sure you get the model that supports them (and China's CDMA). We used our iPhones 7 constantly while in New York, for more hours a day than we should have, taking tons of photos and videos, following maps, checking Twitter, and, yes, hatching eggs and spinning PokéStops. I also stuck my Rogers SIM in my iPhone 7 review unit, which meant roaming on AT&T or, occasionally, T-Mobile. Roaming hits a battery like a battering ram. Through all that, the iPhones 7 held up well. It's impossible to reach a verdict yet, since it's only been a few days and, through them, we were alternating between many different iPhones, including an iPhone 6s, iPhone 6s Plus, and iPhone SE for camera comparisons. We'll conduct more regular, everyday battery tests over the next few weeks and update with our findings. Last year's iPhone 6s enclosure may have replicated the look of iPhone 6, but it was re-engineered out of 7000 series aluminum to strengthen it for 3D Touch, and sneakily included gaskets and seals for a better, albeit unofficial, water resistance. This year's iPhone 7 enclosure may also have replicated the look of the previous two years, but it's once again been re-engineered, this time to officially support iP67 water resistance under IEC standard 6052. That's the same rating as the original Apple Watch. It means dust can't penetrate the enclosure, even in a vacuum. Since manufacturers get to set their own conditions for liquid ingress, though, it roughly means if an accident happens and your iPhone 7 gets splashed, flooded, or dunked, it has a better chance of surviving than previous generations. I phrase it that way, very carefully, because a) water resistance can become less effective over time and with repeated exposure, and b) Apple has expressly pointed out that liquid damage isn't covered under warranty, which is a shame. So, you shouldn't take iPhone 7 shark diving or use it as your regular underwater camera, but if you get caught in the rain, splashed by passing car, tumble into the tub or the pool, or get water bombed at the beach, your iPhone should be fine. Mine took multiple dunks during the filming of our review video (see up top), and didn't break a sweat … not that sweat would have mattered, because water resistant. Removing the headphone jack helped with the water resistance. Some companies use superhydrophobic nanoscopic coating to repel water, and cut power to prevent shorts, so they can keep the headphone jack and still offer water resistance. Not all of them are environmentally friendly, though, and they can wear off over time. That's why not having the jack makes it easier than having it. Likewise, not having the physical Home button. For years, the home button mounted at the bottom of the iPhone's face plate has been a big, clicky, mechanical switch. Now, like the trackpads on recent Macs, it's virtual. Now, when you press the home button, the same metallic ring around it that used to detect finger contact and activate Touch ID also activates pressure sensitivity. (That's to conserve power.) Then the Taptic Engine responds by vibrating horizontally in a way that tricks your finger into thinking it's clicking vertically. And when your iPhone is off, you can't click it at all. That's when you fully realize the proprioceptive illusion. It's science, but it still makes you think physics is a lie and your fingers are liars. Whatever. In addition to proving one less point of potential dust or liquid ingress, there are a few other advantages to virtualizing the home button. It saves space, since it doesn't need a physical switch stacked underneath it, and that decoupling means Apple can tuck the Taptic Engine and circuitry anywhere it fits. It doesn't wear out or go all loosey-goosey the way a physical switch can, which means everyone using AssistiveTouch out of fear of home button failure can relax about it now. It also allows for different types of feedback. A physical click is just a click, but haptic feedback can vary in intensity, duration, and even "feeling". So, pressing the new home button to unlock can feel different than pressing it for quick actions, messages, notifications, ringtones, etc. In practice, it feels just like 3D Touch and you can even adjust to find your preferred pressure "number". Go to Settings > General > Home Button and choose your click from 1 (light), 2 (medium), or 3 (firm). I started at 3 but settled on 2. It does take some getting used to, not so much when you're holding your iPhone in your hand, but when it's on a table or in a car mount. It's there that the lack of physical movement is more noticeable. The sensor is still recessed, though, so you can find it even if you have low or no vision. Apple's staying committed to accessibility. Because I use 3D Touch all the time, I took to it immediately. Because I have RSI from years of grappling and typing, the muscles in my arms are all very happy with it as well. Some people I've spoken to took a few hours or days to get used to it. Others simply don't like it. It's one of those things you'll need to try for yourself. Since the new home button activates on finger contact, it won't work if your fingers are covered in a way that prevents that contact from being detected, or if you use an object like the end of a pen which isn't capacitive. In other words, the home button now works the same way as the screen has since 2007. It's not a big deal, because a) all you could do with covered fingers before was wake up the lock screen, you couldn't tap, swipe, or scroll anyway, b) Raise to Wake now wakes up the lock screen without having to use the home button, c) the power button is still there if you really want to click something, and d) the new home button will work with the same type of capacitive gloves that work on the screen. Take that, winter. Touch ID is the same, second-generation fingerprint identification sensor as last year. Rumor has it, on iPhone 6s it was slowed down ever so slightly. With the new Raise to Wake feature, though, on iPhone 7 it seems to be running at full throttle. It's exciting because, two years into the technology, and my fingers are already being conned into thinking there are physical objects on the screen of my phone. iPhone 7 comes pre-installed with iOS 10, the latest version of Apple's mobile operating system, announced in June and shipped just three days before the phones themselves. Having the latest version of the OS,with software built specifically and only for the hardware it's running on, is hugely valuable. As are the feature and security updates Apple has been providing, for every customer, on every network, in every region, typically for three to four years post-purchase. It's like an insurance policy for the OS. iPhone 7 has access to the full range of iPhone apps. That includes not only the over 2 million now available in the iOS App Store, including the best of Google, Microsoft, — and, coming soon, Nintendo! — but an increasing amount built-in by Apple. Many of the built-in apps can now be deleted — read: hidden — as well, if they're not to your liking. In addition to supporting multicolumn apps in landscape mode on iPhone 7 Plus, and 3D Touch apps on both iPhones 7, new apps that take advantage of the wider P3 color gamut display or photography, of the telephoto lens, and of the new Taptic engine are unique to the new iPhones. Over the last few days, I've pulled wide gamut RAW files off my iPhone and marveled at them on my iMac. I've seen a demo of rack focusing and live curves on a video recording app. I've played a shooting game where you can feel the difference between rapid fire and pump action beneath your fingers, and where you could almost swear you were touching actual, physical piano keys on the screen. That's in the first week, at launch. I can't wait to see what developers do with it all next. iPhone 7 is physically the same size and shape as iPhone 6 and iPhone 6s, but the camera isn't in the same position. That means you can cram an iPhone 7 into a comfortably tolerant older case if you really have to, but you'll want a new case for it. Apple has a full set of them, including a new Smart Battery Case for iPhone 7 — sadly, not for iPhone 7 Plus! — as well as Lightning Docks in black to match the new black iPhones. Other manufacturers are also ramping up fast. 3.5mm headphone jack accessories will need the 3.5mm to Lightning adapter, as mentioned previously, but Bluetooth and Wi-Fi accessories are fully compatible and good to go. iCloud storage can be used for backup, email, contacts, calendars, iCloud Drive documents, iCloud Photo Library, and more. Apple includes 5 GB of iCloud storage with every Apple ID, but it's really not enough in an age of 256 GB devices. Hopefully, Apple will make backups "free" the way iTunes content is, but in the meantime, there's a new 2 TB tier, which is what I'm on. Dropbox, Google Drive, OneDrive, and other popular storage providers, as well as Google Photos, Flickr, Spotify, Rdio, and all major photo and music services are also available for iPhone. Apple Stores, especially when combined with iCloud and the extended warranty service, AppleCare+, provide remarkable customer support for iPhone owners. Apple specialists can help you test a phone to make sure it's what you want, help you set it up, teach you how to use it, and if anything goes wrong, help you fix it. It's a feature not always included on competitive checklists but anyone who's ever needed to avail themselves of it knows just how important a feature it is. With AppleCare+, you can walk in with a damaged iPhone, get a replacement, restore from backup, and walk out with all your data, just the way you left it. It's one of those things few people appreciate until they're in desperate need of it. Apple has also recently dropped the price of an AppleCare+ screen repair. I get it for all my Apple devices, because paranoid and clumsy. Over time, though, I've found it not only to be a great value, but a great advantage of buying from Apple. You're essentially getting 0% financing for 24 months, with an option to upgrade to the next iPhone in 12 months (though this year that process was rocky, to say the least). It's more expensive than some carrier options, but it includes AppleCare+ which makes it more competitive. If you're interested in upgrading every year, and you want AppleCare+, the iPhone Upgrade Program looks terrific. Now we just need it in more countries. 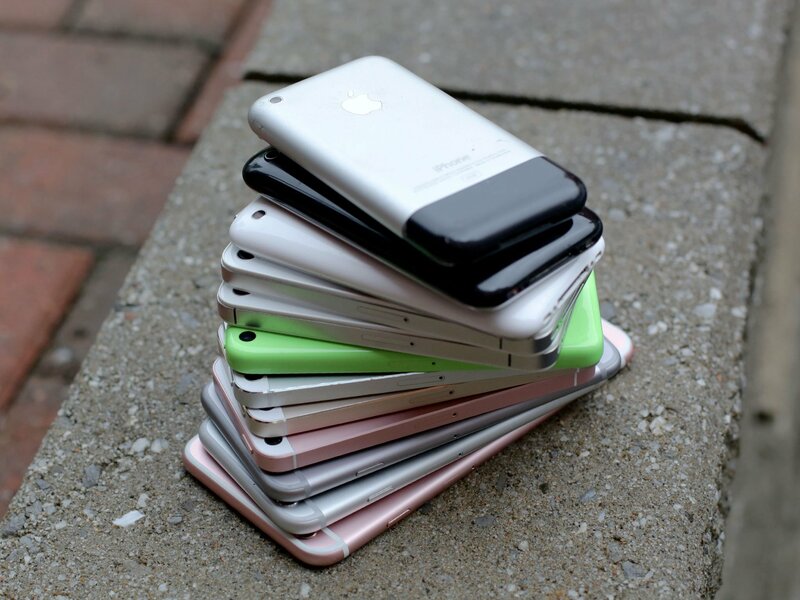 The iPhones 7 are the best iPhones Apple's ever made, but we knew that going in. The real question was, how much better? The answer is much better — and by much more than we expected. A lot of people, myself included, may be tempted to look at iPhone 7 and dream about the future. That's fair, but it's fair every year. Apple isn't dropping the mic and switching to the hot tub business any time soon. There'll always be an iPhone next, so I'm going to keep this review focused on the iPhone now. It has the new A10 system-on-a-chip, which fuses high-performance and high-efficiency cores into a single, incredibly smart processor — we previewed some movie shooting bits that were mind blowing. 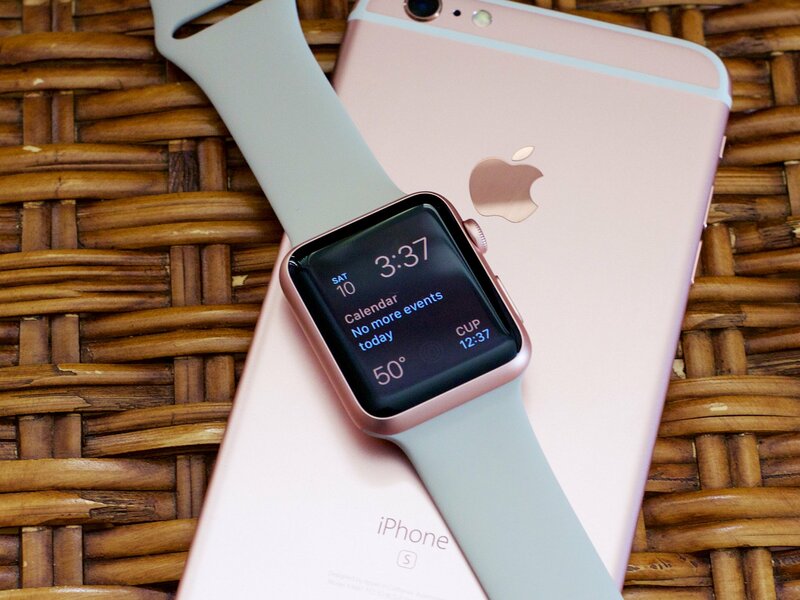 The water resistance can be a life saver, as can the increased battery efficiency. The wide gamut P3 screen is eye-popping, and the new cameras, well, they're a revelation. Able to capture more natural looking photos and videos in a wider range of color and situations than ever before, they make you forget you're holding an iPhone. Add in the lens fusion, both for optical zoom now and simulated bokeh later, and swoon. Apple's as much camera company now as computer, but the computer is a huge part of what makes the camera so great, and when you add in the apps and the connectivity, it makes me want to shoot with nothing else. Yes, the physical arrangements of the atoms that form the enclosure come together in the same shape as last year, even if a lot about those atoms and what's inside that enclosure has been totally re-engineered. But that's the most superficial, cynical level of analysis..
Loss of the headphone jack could be a legitimate deal-breaker for some people, at least right now. Others may simply not like the feel of the new home button, at least not yet. iPhone 6s, iPhone 6s Plus, and iPhone SE, all still for sale, retain the 3.5mm jack and the mechanical home button, and are less expensive if you want an iPhone with both those things. It's the philosophy of all this "fusion" that I keep coming back to, though. Apple fused Mac drives a while ago, letting fast flash combined with mammoth platters provide the best balance for speed and storage. They fused motion tracking in a chip that let it persist longer but without wasting main processor cycles. They fused local and online storage as well, keeping recent and frequently accessed data on-device so you can access it immediately, but moving older, infrequently accessed data to the cloud where it can take up server space rather than your space. They fused artificial intelligence and machine learning, so your data is kept private and secure on your devices, and internet data is pulled down and mixed in only when you want it. Now they're fusing processors and lenses, again coming up with an easy to use, balanced approach, that literally gives the best of both worlds. When things get bigger and faster, you risk leaving the smaller, slower things behind. And that can bite you in the apps — in all the software — if you let it. By keeping both sides in play, though, you get the advantages of the biggest, but mitigate the losses on the other end. By abstracting away the complexity, you don't burden customers with complexity, but you make sure they're constantly getting the very best efficiency and performance for anything and everything they want, when they want it. We're living in an age of fusion, and it's a total win/win. That said, if you've got a recent iPhone, you're fine holding onto it. Unless you want the new performance, protection, power, or mind-blowing photography. For those specific needs, especially photography, it's worth your time to check it out. If you've never had an iPhone before, iPhone 7 and iOS 10 are a great jumping on point. Combine ease of use and accessibility with unmatched customer service and software updates, and it's a compelling upgrade for anyone. iPhone 7 didn't just get us through our trip to New York, it delighted us every step of the way. And that's exactly what I want from a new iPhone.